Resurrection is the first episode in the exciting new paranormal urban fantasy series: Lost Souls. Christian Thompson is killed in a car accident but refuses to pass into the afterlife because of his protective need to shelter his daughter Aurora from her cruel mother. He soon discovers there are others like him, other wandering spirits trapped between the world of the living and the dead. He joins this larger group of Lost Souls in their struggle to destroy the evil endangering their existence. Unholy creatures threaten both Christian’s new world and his old. They are entities called the Changed, beings who were once Lost Souls but who are now dark, dangerous and disturbed monsters. Their ultimate goal is to return to the land of the living by possessing the body of a human. Little does Christian realize that his decision to refuse his own death will endanger the very life of the daughter he has vowed to protect. Imperfection is the second episode in the new urban fantasy series: Lost Souls by Laurel O’Donnell. Sam and her brother Ben, along with their new friend Christian, have just defied the leader of the Lost Souls. Outcast from their former group, the three of them battle the dark forces of the Changed on their own. With the help of their old friend, Eugene, they investigate the mysterious disappearance of one of their Lost Soul brethren. As the investigation deepens, they come to the chilling realization that their nemesis, Scala, has escaped his centuries-old prison with revenge on his twisted mind. A demonic possession leads to grave consequences and the Lost Souls must make a difficult choice between life and death for an innocent victim. 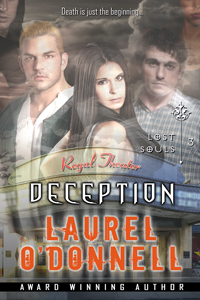 Deception is the third episode in the urban fantasy series: Lost Souls by Laurel O’Donnell. 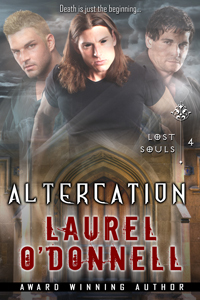 Altercation is the fourth episode in the urban fantasy series: Lost Souls by Laurel O’Donnell. Sam and Christian have mysteriously disappeared. An unlikely group of allies is formed as Damien, Ben and Eugene search for their missing friends. With the calming presence of Sam gone from his life, the urge to make the Jump into a human grows dangerously strong inside of Damien. To add to their anguish, a powerful new menace threatens destruction for both Souls and humans alike. Can they find Sam in time to stop Damien from making the Jump? Can they stop this new foe from gaining strength and building a deadly following? Read Lost Souls – Altercation to find out! 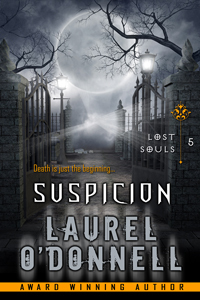 Suspicion is the fifth episode in the urban fantasy series: Lost Souls by Laurel O’Donnell. Your favorite Souls are back! Sam, Ben and Christian join forces with unlikely allies to battle the newest threat to Souls and Humans, the Altered. As the Souls try to discover who their nemesis, Scala, has possessed, Sam fights inner doubts and demons. The Souls look to Sam to lead them, but can she find the courage to save her brother and her friends from their most challenging enemy or will her suspicions doom them all? 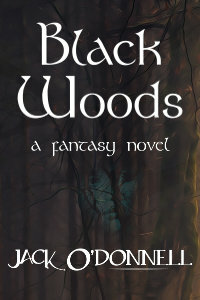 The Black Woods contain darkly gnarled trees born from the seeds of sorcery, strange plants given unnatural life from the fertilizing spread of decaying magic, abnormal soil deeply contaminated with the residue of the Alchemy Wars from decades long past. Pockets of Black Woods have sprouted all over the world of Teradynea in isolated growths of midnight-black trees, most of these unexplored parcels of poisoned land still shrouded in secrecy. The tainted flora and fauna that sprout and flourish within these areas of permanent shadow contain mysterious powers that can be harvested and gathered for good. Or for evil. 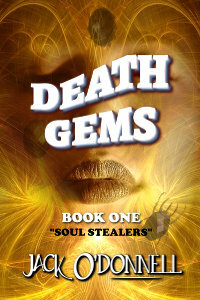 Book One in the exciting new Death Gems series!